Progressives face a tough fight in next year’s Canadian election, currently scheduled for October. Even as the support for the Liberal Party and the New Democratic Party outstrips the Conservatives’, Prime Minister Stephen Harper’s government’s changes to the electoral rules will likely suppress voter turnout and leave the door open to more electoral fraud. As the year comes to a close and the next general election looms, it is worth reflecting how and why this new term has entered the Canadian lexicon. As previously detailed, this summer the Conservatives rushed through parliament the anti-democratic ‘Fair Elections Act’. It eliminates the independent elections monitor (worrying, given the Conservatives were found to have committed electoral fraud in 2011), forbids campaigns to encourage voter turnout, disenfranchises aboriginals, young people, and seniors in changing vouching rules, and enhances the influence of money on election results. Coincidentally, all of these changes benefit the Conservative Party. For the first time in history, the Professional Institute of the Public Service of Canada (the union representing scientists and professionals in the public service) is abandoning its neutrality to actively campaign against Stephen Harper. A recent investigative study by Simon Fraser University found that federal department policies prevent almost all scientists from speaking freely to the media, including those who work on evaluating safety of food and water, the safety and efficacy of medicines, industrial chemicals and other consumer products, as well as on issues surrounding climate change. Stephen Harper and his government have been unashamedly leading the way in what not to do to tackle climate change. As Table 1 shows, the Germanwatch Climate Change Performance Index 2014 finds Canada to be the worst performer of all industrialised countries, well behind India, China, the US, and Russia (based on emission levels, efficiency, renewable energy and climate policy). An Environics Institute for Survey Research survey last week indicates this lack of action is in direct contrast to public opinion. An increasing majority of Canadians accept the scientific evidence behind climate change being caused by human activity; close to nine in 10 Canadians would like to see the federal government doing more to reduce greenhouse gas emissions. A critical number would also be ready to accept a well-designed and effectively communicated carbon-pricing policy. Anti-pipeline protests have been happening across the country. In 2010, Stephen Harper’s government eliminated the mandatory long-form census, replacing it with a voluntary National Household Survey. The reason? It claimed that the compulsory form was an intrusion into Canadians’ privacy. The chief statistician of Statistics Canada resigned over the issue, pointing out that even with the same questions, a voluntary questionnaire undermines the quality of data. Four years later, independent reviews have found the National Household Survey data of dubious and inferior quality; researchers have made calls for its use to avoid. Furthermore, it has cost $22 million more than the long form census, and has delivered data of limited use. On November 6, 2014, Liberal MP Ted Hsu brought forward a private member’s Bill to reinstate the long-form census, currently under debate (though unlikely to be passed). Harper’s government has been taking what Andrew Coyne, a columnist for the National Post, calls ‘baby steps’ towards a flat tax: income splitting for couples with children. The policy allows a high-income earner (typically a man) to transfer part of his income to a lower-earning spouse for tax purposes. Once again, this policy is arguably unfair. Eighty-seven per cent of families will not benefit in any way. The 13 per cent who will benefit are high-income earners with stay-at-home spouses. Additionally, income-splitting reinforces men’s dominant role in relationships; it discourages women from working, as having their own income would increase their personal tax rate. As Linda McQuaig rightly summed up: “Harper is proposing a regressive form of social engineering, using government tax policy to remake the country along the lines of Father Knows Best”. In the Conservatives’ quest to shape public debate around the mantra of ‘government bad, private sector good,’ they have targeted progressive think tanks through extensive audits. The Canada Revenue Agency documents highlight that the audits are occurring because research and educational materials were considered ‘biased’ and ‘one-sided.’ Given that all think tanks produce their research in light of certain values, it is odd that right-wing think tanks have somehow escaped Harper’s special audit program to monitor political activities. As Gutstein’s book, Harperism, documents, it is equally striking that Harper himself maintains close ties to many of the right-wing think tanks – speaking at events, warmly praising their research – while most progressive think tanks in Canada have minimal political connections. This is the title of the one of the chapters in Michael Harris’s recent book, Party of One: Stephen Harper and Canada’s Radical Makeover. It details how the war in Afghanistan drew Canada’s biggest military deployment since the Korean War, a war which left Canadians deeply divided on moral grounds. Not only did Harper and his government remain extremely secretive about what was happening during the war, reprimanding its diplomat on the ground for bringing forth information about the detainees, and proroguing government for two months to delay public interrogations, the recently highlighted treatment of veterans has caused national outrage. The New Veterans Charter (passed with good intentions at the end of the Paul Martin government, though fatally flawed and not amended since) replaced veterans’ lifelong pensions with a one-time lump sum payment. Coupled with inadequate health services, particularly for mental health, homelessness and suicides have become prevalent issues. Over the past ten years, the government has cut $1 billion in Veteran Affairs spending, and have now announced a mere $200 million – payable over 50 years – as a hugely inadequate replacement. The United Nations found that Canada was violating the human rights of First Nations, perpetuating their “abysmal” poverty despite the country’s vast wealth. The Minister of Aboriginal Affairs threatened to stop funding for food, water and health care if First Nations do not follow new accountability legislation. Not only did the government threaten to cut off basic human rights to force its citizens into compliance, but the legislation itself was imposed illegally – there was no consultation, accommodation or consent of First Nations, it is a direct interference with First Nations jurisdictions, and it infringes on their internationally protected right to self-determination. On top of this, the Royal Canadian Mounted Police reported that there is an over-representation of murdered and missing Indigenous women this year; Harper’s government refused to initiate a public inquiry – it was “unnecessary” in their view. Where does Canadian politics stand today? These are only a handful of some of the most recent charges against Harper’s Conservative government. For more details, three books have come out in the past three months: Harperism: How Stephen Harper and His Think Tank Colleagues Have Transformed Canada, Party of One, and Irresponsible Government: The Decline of Parliamentary Democracy in Canada. The question is whether there is a prospect for change next year. In October, Canadians will go to the polls (though rumours suggest that Harper might call an early election). 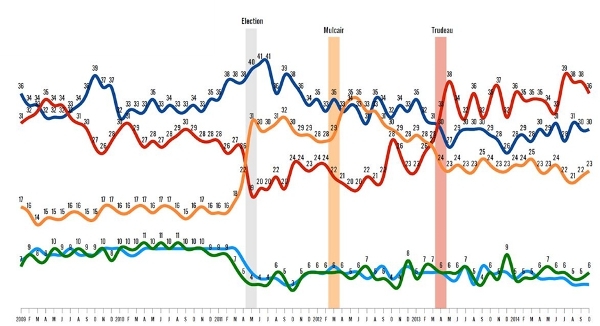 In terms of the polls, as Figure 1 shows, they have been relatively steady since early 2013 (when Justin Trudeau took over as Liberal Party leader): Liberals hovering between 36-38 per cent, Conservatives around 30 per cent and the New Democratic Party (NDP) between 21-24 per cent. 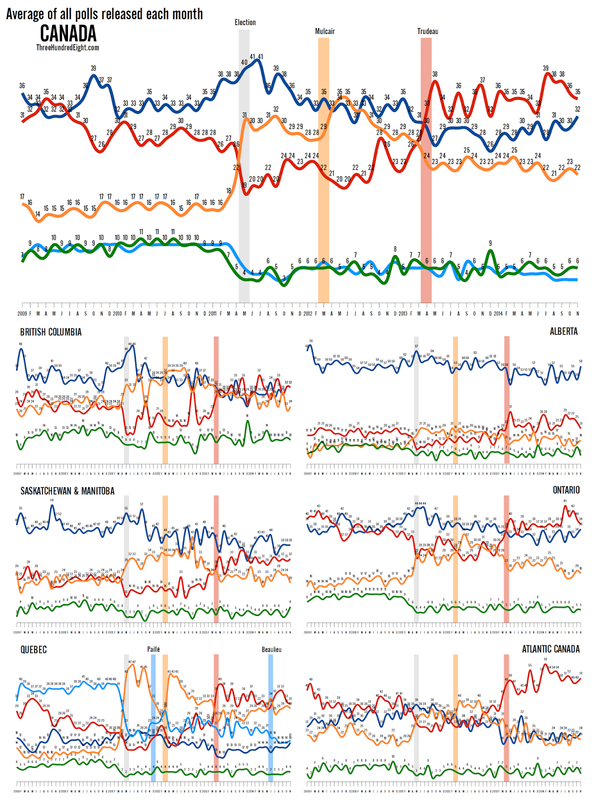 What is remarkable is how this contrasts from the last general election, where the Conservatives won with 40 per cent, the NDP achieved 31 per cent, and the Liberals plummeted to a historically low 19 per cent. Since 2011, it appears the Canadian public has become either more aware, or less supportive of, the direction in which Harper has been taking the country. (Hence the neologism). However, like the UK, Canada is subject to a first-past-the-post system (likely to endure, as last week’s NDP motion “to commit to replacing Canada’s unfair electoral system with a system of mixed-member proportional representation following the next election” was voted down by the Conservatives and some Liberals). Although popular opinion is currently with the Liberals, this would not necessarily translate into an electoral victory. The fear is that the centre-left vote is split too finely between the Liberals and the NDP, leaving neither with enough support to govern. More worryingly, Canadians should be concerned about the potential for more electoral fraud to suppress voter turnout now that the elections monitor is no longer an independent body, but an individual directly responsible to Harper himself. Note: This article originally appeared on the LSE USAPP blog, and is an extended version of a recently published contribution to Policy Network’s State of the Left Bulletin, December 2014. Next article Are we electoral fundamentalists?